This unique ceramic vase is canister shaped which comes with a lid. This is a square shape vase in olive green color and black intricate design on it. 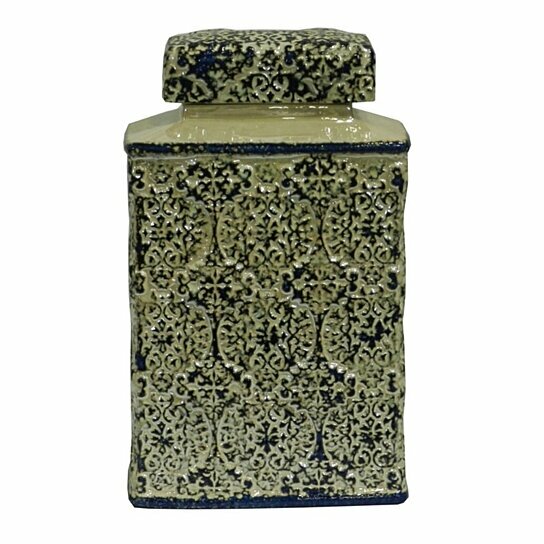 This canister style vase is made from ceramic hence need to handle with care. This will assist you add natural appeal to your interior. The embossed design on the vase offers it attractive look. It can be placed in the drawing room, bedroom and kitchen. This vase is perfect as a storage canister as well.